Your teeth are important, and you want them to be healthy and look good. If you take care of your teeth and the rest of your mouth, you can reduce the chances of painful problems like cavities, abscesses, gingivitis, and other issues. But not everyone knows how to take care of their teeth the right way. Here are five things you can do to help keep your teeth in better condition so that you can have a lower risk of problems both now and in the future. Ideally, you should brush your teeth after meals. Many people do that, and some choose to brush when they get up and before they go to bed, instead. Both can be good options, as long as you brush thoroughly and carefully. Using a toothbrush with a small head is also important because it helps you reach your back teeth and keep them clean. Flossing only needs to be done once per day. Too much sugar and too much acid are both bad for tooth enamel. They can contribute to decay and put the health of your teeth at risk. You can eat the foods you like, but take care and pay attention to what you’re putting in your mouth. That way, you can have teeth that have strong enamel and reduce your risk of cavities. If you play sports or engage in any type of dangerous activity, you’ll want to reduce your injury risk. Helmets and mouth guards are both good choices, depending on the type of activity you’re engaging in. 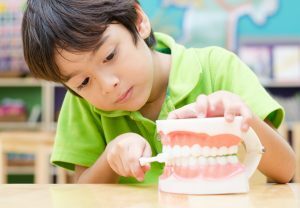 While you can still injure your mouth and teeth, you’ll be less likely to do so, and you could also reduce the severity of the problem if you do get injured. There have been many arguments for and against fluoride in water systems throughout the country, but fluoride in toothpaste is the right choice for healthy teeth. It helps keep your teeth strong, which makes it easier for them to resist cavities and decay. Most toothpaste contains fluoride, but be sure to read the label to make certain of what ingredients you’re getting. Crunching on ice, opening packaging, and other things people do all contribute to damage and put your teeth at risk. Make sure you only use your teeth for chewing food, and don’t use them to pry things open or crush up anything that’s extremely hard. You can chip, crack, and even break teeth that way, which can lead to a lot of pain and expense. Make sure to visit us regularly, so we can help you take better care of your teeth and gums. Oral health is important, and when you maintain healthier teeth at home along with seeing us for checkups and any needed dental work, you give yourself the best possible chance to have a healthy mouth for a long time to come.